Némopolis, the serious gaming in the service of the history. Founded in 2003 by Antoine Izarn, Némopolis published and distributes edugames whose aim is mainly to make discover the history of the French and European legacy. In 2012, Némopolis launches its new opus of the famous historical story game “Voyage dans le temps”. 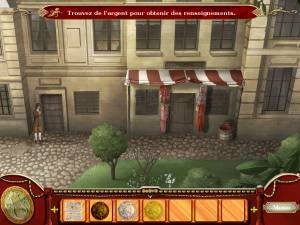 “Marie-Antoinette et les disciples de Loki” is an investigation game based on history that aloows gamers to learn more about the French and European history before the Revolution just by playing. Step by step, the player unlocks an encyclopedia that deals with more than 35 historical thema (Europe before the Revolution, ship journeys…). Synopsis of the game: 1783, an Icelandic volcano, dormant for centuries, has just begun a violent eruption which will change the face of the Europe! 1787, an incredible plot is threatening Marie-Antoinette, while in Prague, Mozart is putting the finishing touches to his opera. The game is available on several platforms adapted to different target: PC, MAC, Nintendo DS and iPad and will be translated in 7 languages (English, German, Spanish, Italian, Japanese, Portuguese and Dutch) for PC/MAC and into 2 languages for Nintendo DS (English and German).